A DragonFly test vehicle throws down with its thrusters during flight tests of the new system. Despite SpaceX's recent failure to land a returning rocket on a barge, they were met with more considerable success in the test-firing of their Dragon 2 capsule. Not your stereotypical-looking Dragon, but it still breathes a lot of fire! The "Crew Dragon" (as opposed to the unmanned delivery-vehicle Dragons that currently ferry supplies to the ISS) was given a "hover test", in which it was suspended over a launchpad and allowed to fire its propulsive thrusters. These thrusters, much like in the classic game Lunar Lander, control the speed and trajectory of descent back to earth. "Eight SuperDraco thrusters, positioned around the perimeter of the vehicle in pairs called “jet packs”, fired up simultaneously to raise the Crew Dragon spacecraft for a five-second hover, generating approximately 33,000 lbs of thrust before returning the vehicle to its resting position. This test was the second of a two-part milestone under NASA’s Commercial Crew Program. The first test—a short firing of the engines intended to verify a healthy propulsion system—was completed November 22, and the longer burn two-days later demonstrated vehicle control while hovering." Is it weird that this elicits an "aww" of cuteness from us? While the initial landings will likely take place via the time-tested NASA tradition of having the spacecraft plunge through the atmosphere while deploying a parachute, there's no denying that SpaceX is on the shortlist to eventually create a spacecraft where all aspects of launch and landing can be directly controlled by its attendant astronauts. Just add astronauts: the interior of the Dragon 2. NASA has announced their initial commercial crew, which is comprised of four veteran American astronauts. Of the three Dragon 2's in production, one will fly unmanned to the International Space Station, while the other two will follow at later dates, bearing the crew. Additionally, if successful, the first Dragon 2 will be assessed for damages and then re-used for an in-flight abort test to be conducted off the coast of Florida. Depending on how effectively the program moves forward, the Dragon 2 could be transporting humans to the space station as early as next year. 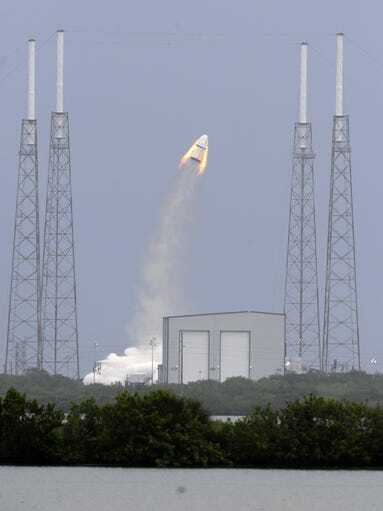 The "Crew Dragon" set loose: a Dragon 2 succeeds in a launchpad abort test conducted last May.